Hey there, blogger or aspiring blogger! The blogging world can be SO overwhelming! I have been blogging off and on since around 2013. It was mostly just so I could remember recipes or share pics of my kids, and occasionally I’d get on a soap box, but I didn’t really do much when it came to sharing, and certainly not with monetizing. In summer 2017, I decided I wanted to take things seriously as I was writing a book and wanted to build an audience who might be receptive to purchasing my book (and here is it, summer 2018, and I haven’t finished the book yet). It had to be a God thing actually. 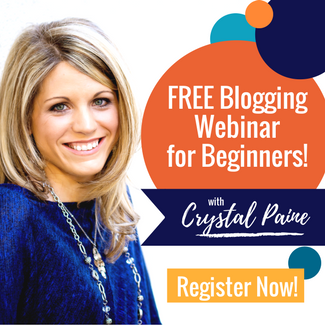 I had been mulling it over and I received an email from Crystal Paine announcing the launch of Your Blogging Mentor/Your Blogging University. I watched her free webinar and she convinced me to take action! There IS money to be made in blogging if you are willing to put in some work (as with anything else). I admit I am not making much money yet but I am starting to see things pick up. A lot of this is passive income that I just “set it and forget it” and let it make money for me. We’ll get to that in a minute. This page contains affiliate links (if applicable) to the brands I recommend. I would never recommend something I haven’t used myself and loved, or if it’s not something I would not use myself (maybe it’s on my list of products to try and I haven’t gotten to it yet). This disclaimer is required by the FTC, and I include the above image on EVERY post. This is blogging 101: always disclose affiliate links! ANYWAY, before you do anything else, I would encourage you to watch Crystal’s free webinar. If you know about watching webinars, you’ll know there is a product to be sold and she will be talking about her blogging course(s) at the end. You can take that or leave it, but I think you should take it! I did end up purchasing her Blog Start-Up101 course so I could get my blog off the ground. It is inexpensive and I feel it’s a good investment. Still, there is good info to glean from the webinar even if you don’t purchase the course. You DO NOT need almost any technical knowledge to start your blog. But you will learn some HTML and CSS as you go, most likely. Or you can pay someone to do things as necessary. My Blog is Up and Running…Now What? Once you’re past the beginning stages, you’ll want to start optimizing your blog and doing some other things to increase your following and build your relationship with them. You’ll want social proof (i.e., an obvious showing that people are reading and enjoying what you offer), and one of the best ways you can do that is by showing how many times your posts have been shared on social media. I highly recommend using Social Warfare from the beginning. This is a plug-in you use for WordPress and it’s extremely affordable! I started using it right before I switched domains so I wouldn’t lose my social share counts in that process. But, it was very tedious to update all the posts with the proper info inserted into Social Warfare because I was not doing it all along. It’s very easy to use…you add an image sized for Facebook/Twitter and another sized for Pinterest, then write the descriptions and titles you want to be pulled when someone shares each post to that particular social media. It makes it so YOU are in control of what is being shown to people when your readers share your posts. A blogging friend recommended it to me awhile back and I wish I had been using it all along! ConvertKit is an amazing email service provider for creators. I have been so impressed with them and they are responsive to any questions you may have. This is not a free option, but it is not expensive and ultimately, your email list should be converting for you (give it some time to build a rapport, though), so this is one of the best investments you can make as a blogger. Speaking of email, Heather Bowen’s course Building an Effective Email List has been instrumental in connecting with my readers. Having a good relationship with your readers is MUCH more important than your number of followers or the size of your list. Hey…that Click to Tweet option is available for free with Social Warfare! I had no idea that was the case and Click to Tweet does have its own paid option, so that was a nice surprise. I’m just getting around to doing this myself, but hosting a “blog party” on your site is a great way to build your audience and get some solid content on your site. It is also a good way to network with other bloggers in your niche, grow your email list, and sell some products. Ana Willis is the one who came up with this strategy and her course has been very informative not just on how to do a blog party, but how to create a course, how to optimize your blog for sales and email signups, how to create graphics for free in Canva, etc. If you are new to the blogging world or need to freshen up your content and your readership, I’d recommend that you follow her guidance and watch your site grow. If you need a way to put a popup on your site for a special event, I have had a lot of success with Sumo. Their free resources are a little limited but you can still customize a popup when you need to direct people to an affiliate sale, your own sale, etc. Yes, popups are annoying, but I learned how well they work after taking Heather’s email course and implementing them on my own site. They convert very well! I mentioned before that affiliate sales can bring passive income (as can creating your own digital products – WooCommerce is my preferred online storefront integration). People can be wary of salesy behavior so the key to this is to incorporate these things naturally into your content. You can add banners within your content and on your sidebar, but moreover, you can write an “evergreen” post on how this product has helped you (not a review per se) and how it can help THEM, or just mention it here and there and include your link so they can find out more. Once your links are in place, you only have to push traffic to that post and let the post you already wrote do the work for you. Pinterest is a great driver of traffic (it’s actually a search engine, not social media). A lot of bloggers like Tailwind to keep your Pinterest (and now your Instagram) active without a lot of work on your end. Facebook has a native scheduler on Pages, which is what I use for now. There are scheduling apps for any and all social media (CoSchedule, Smarter Queue, Meet Edgar…). I’ve yet to try these but it might be something you consider to lighten your workload. And there is a workload! People think blogging is just writing articles…nope! Writing is maybe 25% of it. It can get overwhelming if you don’t manage your time well or keep a running list of what you need to do. You need to create at least two images per post (horizontal for Facebook and Twitter, etc. and vertical for Pinterest), you need to write descriptions for social shares, you need to consider search engine optimization and keywords, you need to decide which ads to run on each post (a free plug-in to use is called Ad Inserter and you’ll need very basic HTML knowledge for this), which affiliate programs to participate in (pretty much everyone uses Amazon’s, but look around in your niche for what affiliate programs are available), you’ll need to share everything across social media once and then again in a few weeks or months, create emails on a regular basis, create products and opt-ins, monitor your Google Analytics, Search Console, and AdSense accounts…there are many Ts to cross and Is to dot. Here’s image number 2 for this post…a pinnable image for Pinterest. Pin it? If you do, you’ll see how Social Warfare works…the image and description will be exactly what I have entered, with no work required by the pinner. a way to make images, you can use Canva (free and paid options) or whatever you’re most comfortable with (I use Photoshop (Adobe Creative Cloud has a highly discounted option for homeschoolers), Adobe Spark (which is free but also integrates with your Creative Cloud account if you upgrade, and Pablo by Buffer). All of these options have stock images you can use for free, with more if you upgrade. That’s really it. You can do the very basics until you get the hang of it. You have to treat it like a job and work at it, that is what is going to make the difference for you. Focus on putting out good content and spread that across social media and search engines (Pinterest works best with good SEO, so be sure to write good descriptions for your pins). Even without the other things, people WILL come back for good content. Be wise in what you spend time on as well. Networking in groups can pay off if you find the right groups. Homeschool Blogger Network is one of my favorites if you are a blogger and you homeschool (it doesn’t have to be your niche, but most ladies there do blog about homeschooling). There are many Facebook groups that can be helpful if you search for them. If there’s any way I can help you get started, don’t hesitate to contact me!